Where do you think the company could improve? Did the company help you accomplish your professional development and career goals? How did this position align with your expectations? Losing an employee is hard. But an exiting employee provides your company with a chance to learn how to improve and reduce employee turnover rates. One of the last meaningful conversations you’ll have with an employee is the exit interview. What is an exit interview? 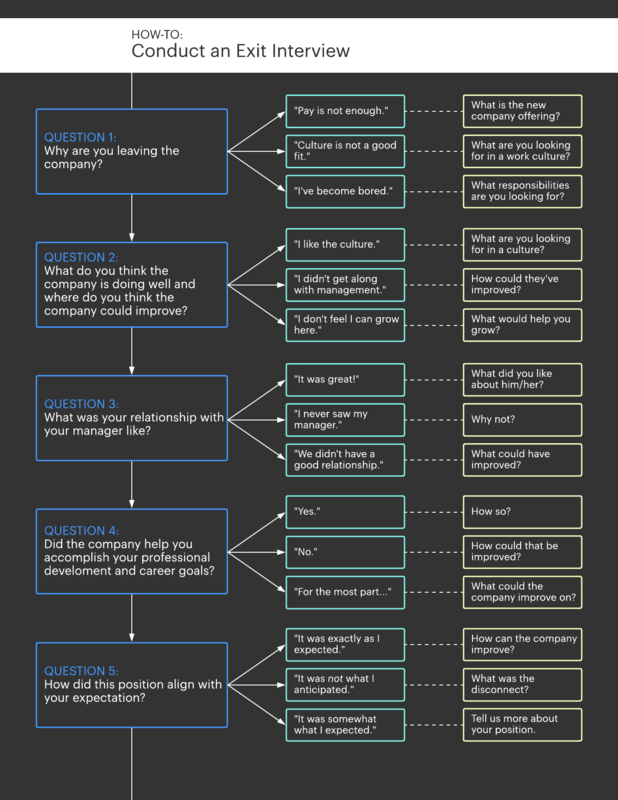 How do you conduct an exit interview? What do you do when the interview is over? Discover exit interview best practices and questions you should—and shouldn’t—ask. 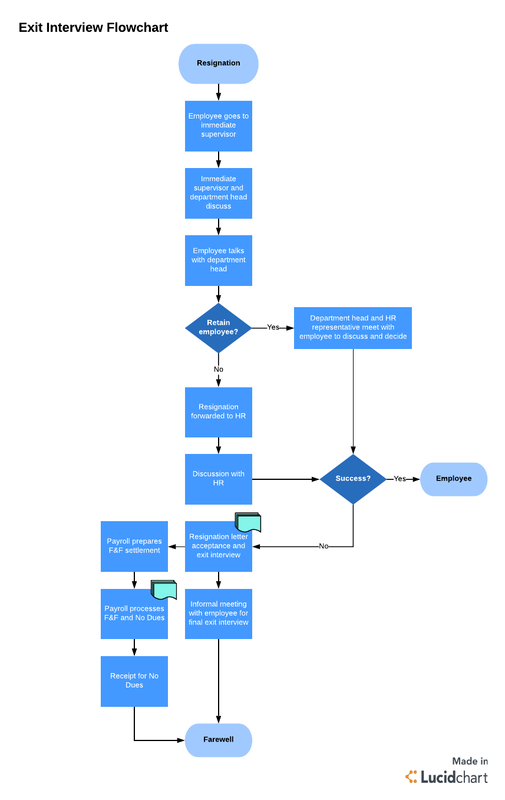 Note: You can track the entire employee exit process, including the steps you should take if you would like to retain the employee, with a process map in Lucidchart. Get started now with this template. An exit interview is a conversation with a departing employee and a representative from Human Resources (HR) or other third party, regarding the employee’s history with the company. The interview typically takes place on one of the employee’s final days. The purpose of the exit interview is to gain insight into the reasons for an employee’s resignation and, where applicable, to act on the feedback given. The information you gain from an exit interview should reveal how you can improve working conditions and increase employee satisfaction. To elicit constructive feedback during the exit interview process, you need to create a culture that welcomes open and honest feedback from day one. If you’re waiting to ask your employees how they feel about your organization until their exit interview, much of what they share won’t make sense or be constructive. Create a culture centered on constructive feedback to resolve issues faster and retain employees. You only have a short amount of time during your interview so you need to make the most of it. Prior to the interview, create an agenda and determine who will conduct the interview. The agenda should contain the questions you plan to ask to help you gather vital information. In Lucidchart, you can build an exit interview script that shows which questions to ask and how you can follow up certain responses to dig deeper into the issue. Choose a neutral interviewer—someone who can ensure that the information gathered is candid. Don’t assign the exiting employee’s direct supervisor to conduct the interview, as this may intimidate the employee and cause them to be less honest with their feedback. State the purpose of the interview. The whole point of talking to the employee is to get their perspective on the company, as well as identify areas where the company can improve. Explain that the interview is confidential. The interviewee will feel more comfortable when they understand that their feedback won’t become office gossip. Encourage the employee to summarize their experience first. This tactic allows you to get some of your questions answered before you begin, so you can spend more time discussing more important questions. Above all, remember to keep the process simple. The interview should be relatively brief and focused on gathering the most important information, rather than spending hours discussing all the company’s problems. 1. Why are you leaving the company? Even if you already know the answer, asking allows you to probe for further reasons as to why an employee might be leaving your company. For example, you may have heard that Mary is leaving your company for a position with better pay. However, during Mary’s exit interview, she reveals that she struggled to get along with her manager. That insight gives you the opportunity to improve a manager’s leadership style, which can prevent more employees from resigning. 2. What do you feel the company is doing right and where do you think the company could improve? 3. What was your relationship with your manager like? You want only the best people running your teams.28% of employees who quit their jobs resign due to conflicts with managers. By asking how an employee felt about their manager, you have a chance to work closely with a manager to help them be more successful—or to reward effective managers. Even if the departing employee says they just didn’t like the manager and their personalities didn’t mix well. This insight still allows you or your hiring managers to look for individuals with a different personality type so both the manager and the new hire get along well. 4. Did the company help you accomplish your professional development and career goals? Employees who feel like they are accomplishing something every day at work are more likely to be satisfied with their jobs. In fact, employees who have access to either internal or external professional development are 10% more likely to remain with their employers. By asking this question, you can see what more you and your managers can do to help employees grow professionally. 5. How did this position align with your expectations? Employees will feel more satisfied with their roles when you create an accurate description of the job. While talking to a departing employee, you can get a sense of how well your job description met their expectations. If you learn that the role didn’t meet their expectations, you may want to edit your job description to ensure you’re attracting the right people. For some employees, the exit interview is a chance for them to air their grievances with the company. You should encourage a professional interview, rather than a gossip session. Below are five questions you should avoid asking during an exit interview to encourage a professional, positive interview and align with exit interview best practices. 1. Are you leaving because of what happened with a certain employee? Engaging in office gossip during an interview doesn’t help you gather constructive feedback and should not be part of the exit interview process. Jacquelyn Smith, a writer for Independent, said, “Don't gossip, point fingers, or throw your colleagues under the bus. It's unprofessional and unkind.” It opens a whole new can of worms and may cause the departing employee to become upset. 2. What do you think about Jane’s performance? Similar to office gossip, it’s not appropriate to ask the employee about a specific person other than their direct manager. Instead, gather feedback about the team as a whole. 3. Can we discuss a personal issue? The purpose of an exit interview is to discuss an employee’s work experience and determine areas in which your company can improve. An exit interview is not the place to dive into an employee’s personal issues, as it can offend or anger them, potentially ruining the interview. 4. How do you really feel about the company? An exit interview isn’t a therapy session. You want to avoid encouraging the departing employee to discuss all their grievances with the company. If you want to know how they felt about a specific company policy or process, ask specifically. 5. Is there anything we can do to change your mind? The exit interview isn’t the place to ask employees to reconsider their decision—if you’re willing to change conditions or compensation to keep an employee, you should discuss terms soon after the employee submits their notice. Instead of preventing this particular employee from leaving, an exit interview should help you learn how to improve conditions and keep other employees from leaving. 22% make changes to the work environment. By acting on the feedback you receive during exit interviews, you reduce the amount of employee turnover and build your team’s confidence in your organization. No matter why an employee is leaving, the exit interview creates a unique opportunity for you to learn how your organization can stay ahead of the competition, drive innovation, and increase employee satisfaction.